Welcome to Turbulence Training Day 22. Home fitness workouts that'll burn fat and sculpt your body in 4 weeks. 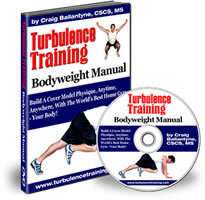 This is day 22 of Turbulence Training's Buff Dudes and Hot Chicks fat burning workout. I'm just about to head out in the car so I thought I'd give you a quick update on today's workout. It was actually really hard today, I'm not too sure why. Sometimes you just have an off day where you have a hard workout. Just like anything else in life, you can have an off day for no particular reason. Today it felt hard from the warm up, so I kind of knew it was gonna be a tough workout. But I got through it, I completed it. The thought of not completing it was unbearable for me, so that was my motivation to keep me going. I had to complete it and I did, and I felt good for it afterwards. It's been a tough start to the week, but a good recovery day tomorrow and I'm sure I'll be back on track by Wednesday. So get to Better4Fitness.com and check out what I'm doing, get involved too. Start your workouts, the hardest part is starting, once you've started, your momentum carries you on. You get more motivated as you go along as you see the results in your body. That's it from a very tired Asad on Day 22, I'll see you tomorrow, take care."